A relatively gentle opening - until you reach the green! A well-executed tee shot of about 220 yards (from the blue tee) will avoid the large traps on the left and palm trees beyond the fairway. UpHills approach to the green should be kept short and right of the hole, as putts from the back left can be extremely fast. A demanding Par 3. A water hazard runs the length of the hole on the left, with large sand traps surrounding the green. Many players come up short or fail to judge the direction of cross-winds - look at the tops of the trees and the water surface! Again, extremely fast from the middle of the green to the front. A lofted wood will generally be more forgiving than a long iron for most golfers. The fairway is narrow, tree lined and uphill all the way on this longest Par 4 on the course. The giant Calabash tree dictates play. Accurate drives will select a right or left route up the fairway as second shots from the centre will require shaping round the tree. The length of the green makes checking the pin position essential in club selection. Accuracy from the tee is vital. OB runs from tee to green on the left. This fairway slopes towards a deep hollow on the right so a right-to-left tee shot is ideal. Approach shots to the front to back sloping, two-level green, tend to bounce forward and right. Downhill putts to or on the lower level are some of the fastest on the course. For long hitters, reaching the green is only possible if the drive is struck perfectly over the Flame tree to the right side of the fairway and the second shot is right-to-left around the dogleg. 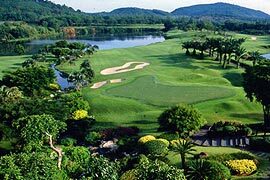 For others, drive between the Flame tree and the towering coconut palms on the left, then hit over the water, taking careful note of the distance to and over the bunkers. The two-level green is normally very fast from back to front. There is a blind bunker guarding the green on the front left and another deep bunker at front right. The green slopes steeply from the left to right so getting up and down from the left side is almost impossible! From the front, putts will be fast with more break than you think. If you miss the green, better to miss it long! Only a long and well placed drive favouring the right side will give a clear view of this well guarded three-level green. Do not attempt to carry the trap on the left from the tee- there is another lurking behind it! Check the pin position and yardage carefully to land your approach on the correct level to give yourself a birdie chance! A look from the higher back tee will give a clear picture of the hole and superb views of the golf course. A drive down the right is safest. If bunkered from the tee, make sure the next shot is from grass, or this easy looking hole could turn nasty! The second shot to the green is more downhill than its first appears- consider one less club. The water crossing the fairway is reachable for the longer hitter on this slightly downhill tee shot. The ideal position is as close to the water as possible favouring the right side. This opens up the second shot landing area, well guarded by bunkers on the left and by palm trees over the fairway. Club selection and accuracy are critical on the approach to the long narrow green, with sand and then water on both sides. OB right may be a factor for the short hitter. Longer drives erring right will run out of fairway or even reach the water. A well-struck drive down the "fast lane" on the left will gain extra roll. If laying up short of water with your second shot, keep left as the landing area slopes towards the lake on the right. If the hole is cut at the front of the green, a conservative approach shot beyond the flag will leave a very fast downhill putt. From the tee, check the yardage very carefully. Select a tee shot line within your capabilities! For the big hitter, the line is just left of the far right bunker over the canyon. For others, aim at the bunker to the left of the trees at the corner of the canyon. Easy to miss this shallow green long, which then makes the up and down almost impossible. Putts from above the hole are extremely fast and break more than you expect toward the fairway. Club selection is critical on this par 3. Take one and a half clubs less, or even two from the black tees to account for the drop to the green. It is difficult to feel the cross-winds so look at the flag and the surface of the water to determine strength and direction. Visualize the perfect ball flight and enjoy one of the most spectacular shots in golf. A double dog-leg, left then right. The tee shot needs to avoid the bunker on the left and OB on the right. If the drive is short, it may be better to lay up to the water hazard that crosses the fairway. If attempting the carry, unseen traps on the right must also be avoided: In both cases, slightly left of the tallest tree beyond the fairway will be the best line. The green slopes mainly from left to right. A good drive up the right side and a well executed short to medium iron will allow a putt for birdie. However, the approach shot over the front bunker must be soft landing, as putts level with or above the hole can be very awkward. PRO TIP: to hit this shot, feet closer together, ball position slightly more forward, brush the grass and finish high. Described by Fred Couples as "one of the best Par 3's anywhere in the world", this exacting hole favours a left to right shot. Although it may not appear so, the hole is downhill and the green slopes from front to back, so select one club less than normal. Around the green getting up and down from anywhere else but long and left can be very difficult. The best option may be to aim there and chip close for a well-earned par. From the black tee, a 260-yard drive is required to carry the lake. Even from the forward tees, most players opt for the sound strategy of keeping left. Flirt with the water only if the hole is cut left and you need a birdie! Do not attack the flag too hard. Bogey or worse is almost certain from behind the green. PRO TIP: Tee up your ball as near as possible to the water to give the safest angle to the fairway.